Update, 9:35 p.m.: Canadian officials have told reporters that the gunman, Michael Zehaf-Bibeau, is a convert to Islam. He had viewed jihadist web pages urging people to "carry out attacks on Canada." Prime Minister Stephen Harper called it a terrorist attack in a speech Wednesday evening. Two people, a reserve soldier from Hamilton, Ontario and his apparent murderer, were killed Wednesday morning in an attack that started at Canada's national War Memorial. One gunman was shot and killed a short time later inside the nearby Parliament building. It is not yet clear whether additional people were involved in the attack. Video taken by a reporter for Canada's Globe and Mail seems to capture a shootout inside the Parliament building that led to the gunman's death. Canadian authorities are saying very little. 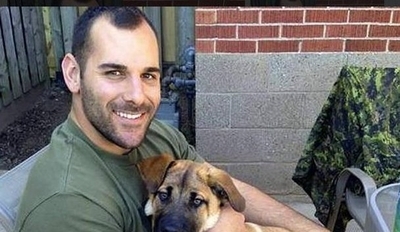 But the murder of 24-year-old Nathan Cirillo comes two days after another Canadian soldier died near Montreal after being run down by a car driven by a recent convert to Islam. CBS News reported late Wednesday afternoon that Canadian officials informed American counterparts that the dead shooter is Michael Zehaf-Bibeau, a Canadian native who was about 32 years old. A Twitter post claimed that the terrorist group ISIS released a picture it claimed was Zehaf-Bibeau. If Wednesday's attacker also proves to be a radical Islamist, it would be at least the fourth attack by Muslim radicals in North America in recent months. Martin Couture-Rouleau, 25, was shot and killed after he rammed his car into two Canadian soldiers Monday. He reportedly told a 911 operator he was acting in the name of Allah. A friend told reporters that Rouleau had grown radical after converting to Islam about a year ago and dreamed of dying as a martyr. His passport was confiscated and he was among 90 suspected Islamic radicals being monitored by Canadian authorities. During a news conference Wednesday afternoon, officials declined to say whether the man shot and killed in Parliament also was on that watch list. Last week, before the two attacks, Canada raised its terror-threat level for the first time in four years. A spokesman said the move was prompted by "an increase in general chatter from radical Islamist organizations like (ISIS), Al Qaida, Al Shabaab and others who pose a clear threat to Canadians." The advisory from Canada's Integrated Terrorism Assessment Centre (ITAC), warned that "an individual or group within Canada or abroad has the intent and capability to commit an act of terrorism. ITAC assesses that a violent act of terrorism could occur." But during Wednesday's news conference, officials said no additional security was in place at the War Memorial or on Parliament Hill. The United States also has seen recent killings by people who cited Islamic ideology as their motivation. Alton Nolen, a convert to Islam, beheaded a co-worker and attacked a second person last month after being fired from his job at a food company. While the murder has been cast as workplace violence, Nolen's social media posts included a picture of Osama bin Laden and a beheading, in addition to anti-Semitic and anti-American comments. "Sharia law is coming," read one post, placed under a picture of the Pope. Meanwhile, a Seattle man, Ali Muhammad Brown, repeatedly invoked his Muslim faith while being interrogated by detectives in connection with four murders from Washington to New Jersey. Each victim was shot repeatedly. "My life is based on living in the cause of Allah," Brown said. "Living in the cause of Allah. To live for Allah, to die for Allah." While some details of that interrogation have been described in court papers, the Investigative Project on Terrorism obtained a copy of the full one hour and 44 minute conversation. Brown expressed disdain for gay people – two of his victims are believed to have been gay – describing homosexuality as "completely against nature" but stating the government allows "this evil to fester." He repeatedly invoked the idea that an Islamic Caliphate, or Islamic rule, is the only way to restore order to American society. Brown also is suspected in armed robberies in New Jersey. He told detectives he thought about leaving America to "go to the land where God the almighty, Allah, is established and implemented." Muslims, Brown said, cannot practice their religion in America, "because jihad is a part of our religion." But Islamic law, governed by a Caliphate, can cure America of its social ills, he said, citing brutal punishment for those caught breaking the law. Prison doesn't work. In Islam, however, "you cut the hand in public for everyone to see. You alleviate all your thieves right there ... You behead someone right there in public, in the streets? You alleviate all the problems like that." Neither Brown nor Nolen have been charged with terrorism. Eighteen months ago, Dzhokhar and Tamerlan Tsarnaev placed homemade bombs at the Boston Marathon's finish line. Tamerlan was killed in a later shootout with police. While hiding out from police, Dzhokhar Tsarnaev wrote that the attack was retaliation for American military action in Iraq and Afghanistan. Despite these first-hand explanations, Islamist groups and some advocates continue to argue that religion has nothing to do with terrorist violence. This has happened before. In 2006, a group which became known as the "Toronto 18" was arrested as it planned a series of terrorist attacks against members of Parliament, the prime minister and the Parliament itself. One member of the group reportedly was killed recently while fighting in Syria. In the United States, Army psychiatrist Nidal Malik Hasan killed 13 people and wounded 32 more in a shooting spree at Fort Hood, Texas. This attack followed a series of Hasan's communications with Yemen-based al-Qaida cleric Anwar al-Awlaki. Though Awlaki would later be killed in a U.S. drone strike, Hasan's attack has never been classified by the government as a terrorist act. His victims have been denied Purple Hearts. When Pvt. Naser Jason Abdo was caught plotting a subsequent terror plot targeting Fort Hood, he told his own mother that, "The reason is religion, Mom." "When bad things are happening" to Muslims, he said, "you have to do something about it." It's not yet clear whether Zehaf-Bibeau shared any ideology like that or was motivated by entirely separate reasons. But the spike in self-directed terror attacks is a cause for concern and a growing challenge for intelligence and security officials in the Canada and the United States. Islam had nothing to do with this? Most westerners fervently wish to believe that the "Meccan Suras" are the "real Islam". They would prefer that the Medinan Suras "just go away". Unfortunately, they are two sides of the same coin. It's high time that the West studied and understood the reality of Islamic Doctrine in its veracity, not from a "wishful thinking" point of view.